I can’t believe I’ve been creating Valentine’s Day quilling tutorials for this site for the last 4 years. And for some reason, I never run out of heart inspiration. In fact, this year, I’ll be sharing 2 different crafts! Up first, fringed paper Valentine’s Day hearts, that we’re going to turn into a garden of flowers! This project is perfect for beginner quillers who are looking for a way to add some texture to their craft. The first step, as usual, is to choose your quilling paper strips. I’m using deep rose and pale pink for my fringed hearts. But I’ll need a couple of strips of dark red when I make my Valentine’s Day card later on. You’ll also need some craft glue in a needle nosed bottle, a slotted quilling tool and small scissors. You’re going to be making the fringed hearts out of a triple-layer of quilling strips. I used this same technique when making the centers of the coneflowers last autumn. I found that layering the strips keeps the fringe separated and defined, rather than just a big mess. To start, apply a very thin line of glue along the side edge of a strip of rose paper. Next, line the pale pink up so it is slightly overlapping the rose and let dry. This may be difficult on long quilling paper strips at first, so I would recommend practicing on shorter strips. Or try only applying a small line of glue to attach a little bit of the pink at a time, instead of all at once. I find this helps the pale pink stay straight. When you’re looking at the other side of the paper you should see an even line of pink all the way down. When your pink strip has set, glue a second strip of rose-colored paper right on top of the first. The pale pink should now be sandwiched between 2 strips of rose. Use a small set of scissors to fringe the entire length. Take care to only make very small snips, not cut all the way through. It may be helpful to use a binder clip as a guide. There is a photo of this in the coneflower post, too. You can also use fringing scissors if you have them. Once the entire strip is fringed, roll loosely with a slotted quilling tool. Let your coil unravel just a bit, so it’s not completely compact. Repeat the above steps to make another roll of the same size. Be sure to use the exact same length strips so the coils end up being the same! Pinch each coil into a teardrop. Glue the teardrops together to complete your heart. I would recommend using pins here to keep your heart together, so you don’t have to hold it with your hands as it dries. You could make fringed paper hearts in different sizes. I made one from 18″ strips and 2 others from 10″ strips. I decided to use these hearts as a field of flowers on a Valentine’s Day card. To add some variety to your card, create a couple “flower buds” to go in your garden. This time, use strips between 6″ – 8″ and replace the pale pink with dark red quilling paper when making the triple-layer strips. Fringe and roll the same way, but don’t pinch into a teardrop. You’ll want to leave them in a coil shape to represent flowers in your garden that haven’t bloomed yet. Wrap the dark red fringed coils with the same triple-layer pale pink strips that you used for the hearts. I think this makes them look like they are buds from the same type of flowers. To complete my heart flower garden look, I made some grass on my quilling comb. Then just play around with the pieces of your garden until you are happy with the look. If you’d like, try some basic letter stamps to create a short message of love on a blank card. Lastly, use some white glue so the fringed quilling paper heart flowers, buds, and grass would stick securely to the card. Whatever your message, I’m sure this charming garden of hearts would be a sweet gift to someone you love this Valentine’s Day. Or you’ll be inspried to use these fringed quilling paper hearts in a different way. I’d love to hear your questions or ideas about this project! 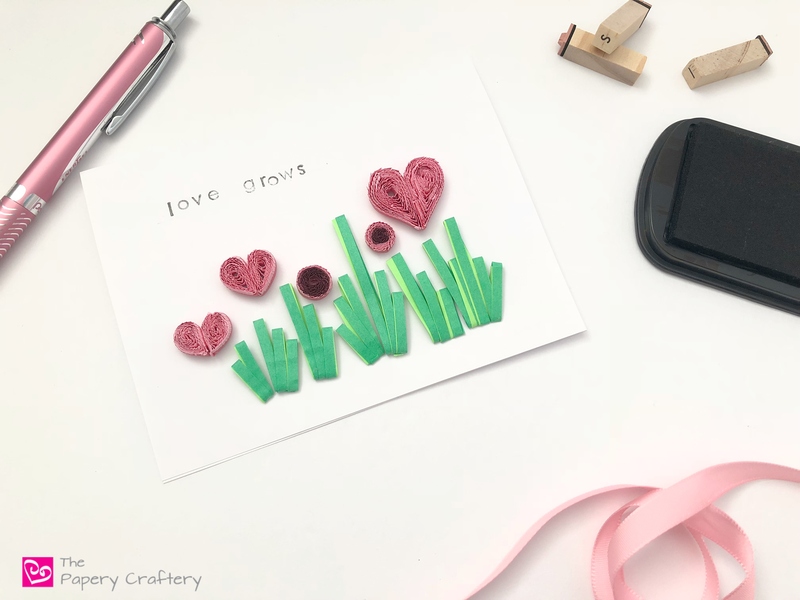 Leave your comments below and I’ll be back in a bit with another Valentine’s quilling craft!